February 4th – Do you know the real TRUTH about Common Core? Do you know the real TRUTH about Common Core? Note from the Library: Besides the library’s parking lot, parking is available behind Taco Bell and to the larger lot west of Taco Bell. 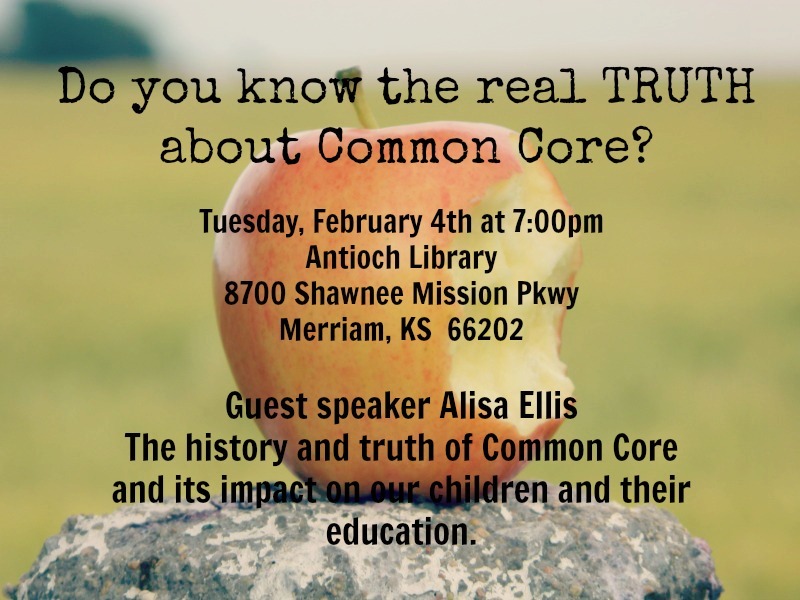 Guest speaker, Alisa Ellis will speak on the history and truth of Common Core and its impact on our children and their education. Alisa Ellis is a mother of seven ranging from pre-K to 10th grade. She and her husband reside in Utah. She holds a Bachelors of Science in Family, Home and Social Sciences. In the Spring of 2011, she became concerned with apparent change in her children’s curricula which prompted her to spend countless hours researching Utah’s education grants, governing documents, and the detailed development of Common Core. She could not ignore what she discovered. Alisa is now asked to speak at public forums across the nation, Utah legislative meetings, radio appearances and more. Megan King is a Kansas mom, and co-founder of Kansans Against Common Core. She will be presenting updates and information on the latest in the efforts to STOP Common Core (Kansas College & Career Ready Standards) in Kansas. *This meeting is being hosted and organized by a concerned group of parents taking action in the Kansas City area. If you would like to contact them directly, or need more information we would be happy to put you in touch with them. Email kristin@kansansagainstcommoncore.com or megan@kansansagainstcommoncore.com to be put in contact with other Kansans fighting Common Core (Kansas College & Career Ready Standards) in local communities across the state. Didn’t make it to the Capitol last week? Thank you to everyone who came to Topeka last week, sent emails, made phone calls and sent letters! We had a great three days, and enjoyed meeting Kansans from Dodge City to Council Grove to Kansas City. We had families, parents, grandparents and concerned Kansans voicing their opposition to Common Core! Although we will not be there like we were last week, there will be some individuals and small groups planning to be there on those days. We are happy to put you in contact with them. 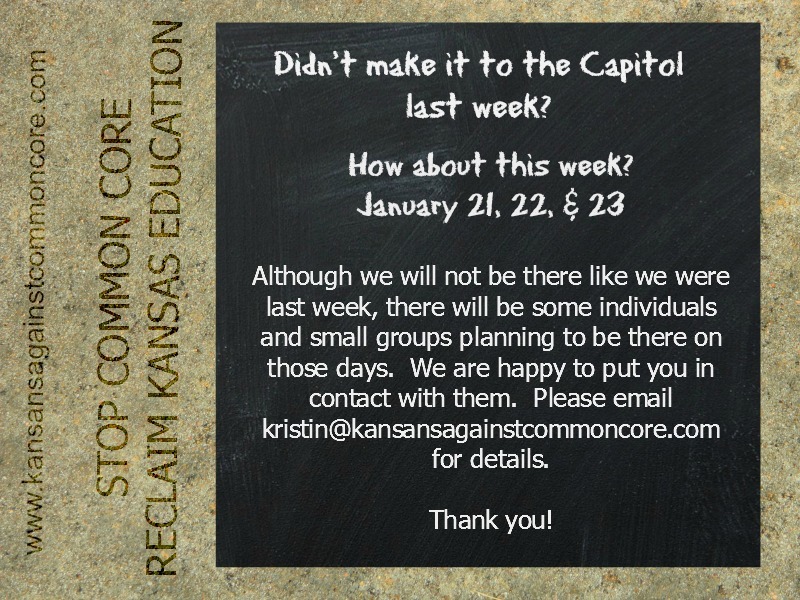 Please email kristin@kansansagainstcommoncore.com for details. Please keep up the phone calls, emails, letters and tweets to your Representative and Senator, and the Governor’s Office. The state legislature can do this with passage of a simple law. But they need to know that this is important. This is critical. TONIGHT! Do you know the real TRUTH about Common Core? Dr. Mary Byrne will discuss the history and truth of Common Core, its impact on education, assessments, data collection on our children and more. Dr. Mary Byrne has a M.Ed. in instructional design and a doctorate in special education from Teachers College, Columbia University. She has spent the past thirty-five years in education—her first 10 years as a special educator teaching all grade levels, including work as a coordinator of curriculum, assessment, and accreditation and most recently in differentiated instruction within the regular classroom. We are asking you to take just one day out of your schedule to make a difference! NEXT WEEK on January 13th the next legislative session will begin. We need every concerned Kansan to help spread the truth about Common Core and participate in the effort to restore local education in Kansas. This week we want you to REPEAT the previous Call to Actions! 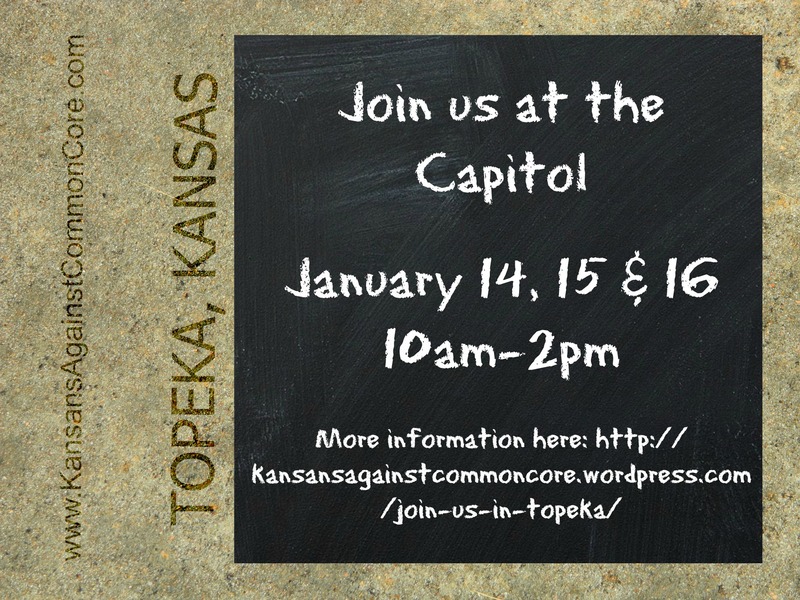 We will be visiting the Capitol next week to visit with legislators about Common Core! If you can’t make it next week, please consider making a visit to Topeka the following week on January 21st, 22nd or 23rd.